* Please no CHECK IN'S or CHECK OUTS on Saturday's. This room is being completley renevated and we will have pictures coming in July 2019 or inquire with us we have some mock ups its beautiful!! Modern and fresh with a great Vermont flavor. 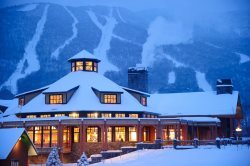 Stowe Mountain Rentals is offering this privately owned luxury 2-Bedroom suite located directly inside THE LODGE AT SPRUCE PEAK on the 4th floor with beautiful views of Smugglers Notch and Spruce Peak. Enjoy the convenience of ski in ski out, heated outdoor pool, hot tubs and all the activities offered at the Lodge. Sleeps 8. Approximately 1,500 sq ft.
- If you would like to bring a dog, please know it is $100 per dog max 2 dogs. The front desk is open 24 hours a day for check-in. We had an awesome, relaxing vacation and hope to do it again! Great service from the hotel. We loved it and hope to stay in the exact same property again. Great long hallway that blocks sound. Great for pets and little children. Fantastic stay. Very comfortable beds, wonderful hotel.